Union, NJ, is home to nearly 57,000 people. It occupies northern Union County in the area that was called Connecticut Farms in the 18th Century. Nearly 57,000 people live in Union. Central Five-Jefferson School serves grade 5, and Burnet Middle School and Kawameeh Middle School serve grades 6 though 8. Union High School serves 2400 students in grades 9-12. To browse the 344 homes offered for sale in Union, click here. 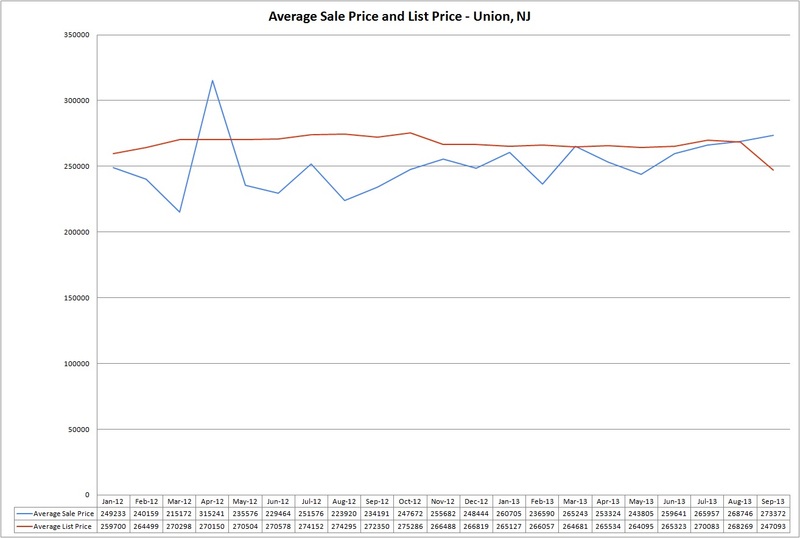 The average sale price in Union in September was $273,372. This is 17% higher than the average sale price in September of 2012. To see photos and descriptions of all of the homes currently offered for sale in Union, please click here. Springfield, NJ, is located in northern Union County and is home to roughly 15,000 people. New Jersey Monthly magazine ranked Springfield as the 85th best place to live in New Jersey. All of Springfield’s public schools are named for notably Springfield residents. Students in Springfield attend Edward V. Walton Early Childhood Center for grades Pre-K to 2, James Caldwell Elementary School in grades 3-5, Thelma L. Sandmeier Elementery School for grades 6-8 and Jonathan Dayton High School for grades 9-12. Springfield students also attend Saint James the Apostle School serving grades Pre-K through 8. Springfield currently has 5.2 months of inventory. This number tells you how many months it would take for all the current homes for sale on the market to sell, based upon the rate of sales in the past. A Months of Supply of more than 5 months is what real estate professionals often call a “buyer’s market.” This means that there are more sellers than buyers in the area and homes are selling slower than they are being put on the market. Typically, this decreases prices. There are 109 homes for sale in Springfield today. Fifteen were sold in September. 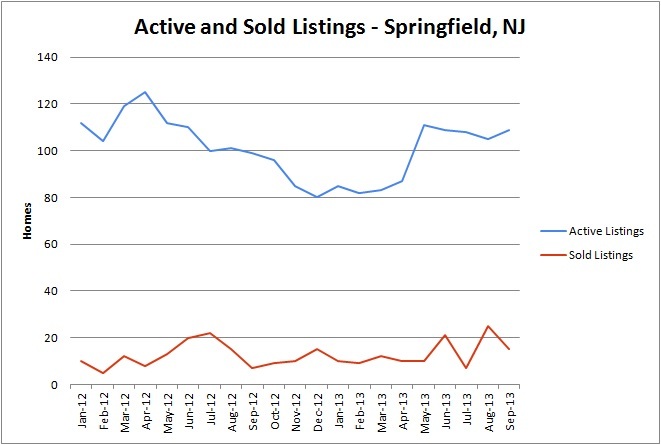 The average sale price in Springfield in September was $443,574. This is 11% higher than the average sale price in September of 2012. To see a complete list of all homes offered for sale in Springfield, NJ, please click here. Come and see this BEAUTIFUL 5 bedroom, 2.1 bath home. This home features custom hardwood flooring, fireplace, fenced in yard, covered deck, partly finished basement, and a huge eat in kitchen. It has an in-law suite which features a living room, kitchen, 3 bedrooms and a full bath. Living here you’ll have easy access to the Garden State Parkway, Routes 22 and 78 as well as the New Jersey Turnpike. This home is listed for only $329,000. Come by and take a look! Scotch Plains, NJ is home to about 23,000 people in southern Union County. It was the site of the Battle of Short Hills during the American Revolution. It was also home of the first African American country club, the Shady Rest Country Club, now the site of the Scotch Hills Municipal golf course. Students in Scotch Plains are served by the Scotch Plains-Fanwood Regional School District which includes five elementary schools, two middle schools, and Scotch Plains-Fanwood High School. Scotch Plains is also home to theUnion County Vocational Technical Schools and Union Catholic Regional High School. Union County College has a facility in Scotch Plains as well. New Jersey Transit passes through Scotch Plains and carries passengers to the Port Authority in Manhattan in about 45 minutes, making for an easy commute for Scotch Plains residents working in New York City. 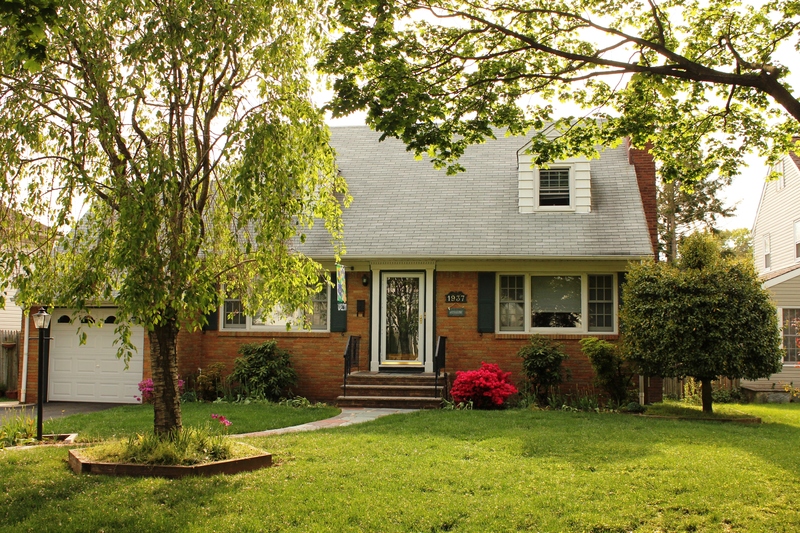 There are currently 131 homes offered for sale in Scotch Plains. This is a 14% reduction in inventory since September of 2012. Decreased inventory usually results in an increase in prices. 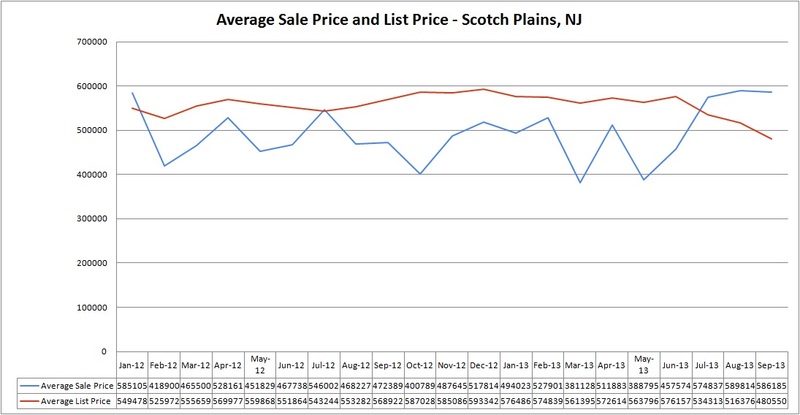 The average sale price in Scotch Plains in September was $586,185. As predicted, this is a 24% increase in sold price since September of 2012. 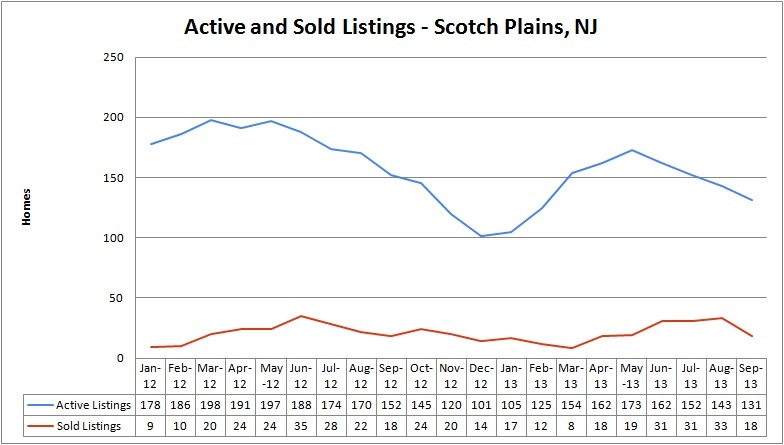 Homes in Scotch Plains are selling quickly. 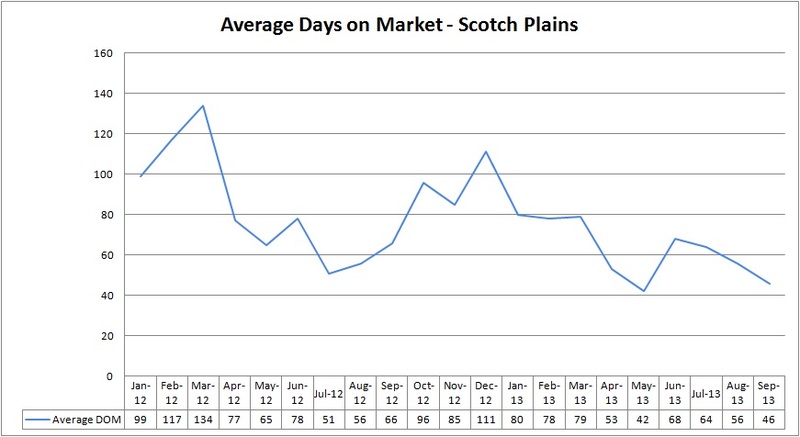 The average home in Scotch Plains sold after 46 days on the market, significantly lower than the average home in Union County and 30% faster than September, 2012. New Jersey Monthly magazine ranked Mountainside as its 16th best place to live in its 2008 rankings of the “Best Places To Live” in New Jersey, as well as eighth in the 2010 list. Currently, there are 43 homes offered for sale in Mountainside, representing a 14% decrease in inventory compared to September of 2012. The average home that sold in Mountainside in September sold for $734,339. This is 44% higher than average sales in September of 2012. Real Estate Professionals judge the strength of a real estate market based upon the Months of Supply in the area. This number tells you how many months it would take for all the current homes for sale on the market to sell, based upon the rate of sales in the past. A Months of Supply of 5 months is considered average – buyers and sellers are about equal in the area and homes are being bought at about the same rate that they are being put on the market. A Months of Supply of less than 5 months is what real estate professionals often call a “seller’s market.” This means that there are more buyers than sellers in the area and homes are selling quicker than they are being put on the market. Typically, this increases prices. A Months of Supply of greater than 5 months is what real estate professionals call a “buyer’s market.” This means that there are more sellers than buyers in the area and homes are sitting unsold for a while. Typically, this decreases prices. Mountainside is currently experiencing a month’s supply of 3.38. Buyers may have a tough time getting in the market if they don’t act quickly. How’s Linden’s real estate market? The city of Linden is home to about 40,000 people who are served by the Linden Public School system with eight elementary schools, McManus and Joseph E. Soehl Middle Schools, and Linden High School. Linden homeowners enjoy one of the lowest tax rates in Union County. Currently, there are 245 homes offered for sale in Linden. In September, there were 22 homes sold. The average home sold in Linden in September sold for $221,739 after 85 days on the market. Not only is this much quicker than homes have been selling in Linden, it is also 15% higher than the average home sold in September of 2012. Real Estate Professionals judge the strength of a real estate market based upon the Months of Supply in the area. This number tells you how many months it would take for all the current homes for sale on the market to sell, based upon the rate of sales in the past. A Months of Supply of 5 months is considered average – buyers and sellers are about equal in the area and homes are being bought at about the same rate that they are being put on the market. A Months of Supply of less than 5 months is what real estate professionals often call a “seller’s market.” This means that there are more buyers than sellers in the area and homes are selling quicker than they are being put on the market. Typically, this increases prices. A Months of Supply of greater than 5 months is what real estate professionals call a “buyer’s market.” This means that there are more sellers than buyers in the area and homes are sitting unsold for a while. Typically, this decreases prices. 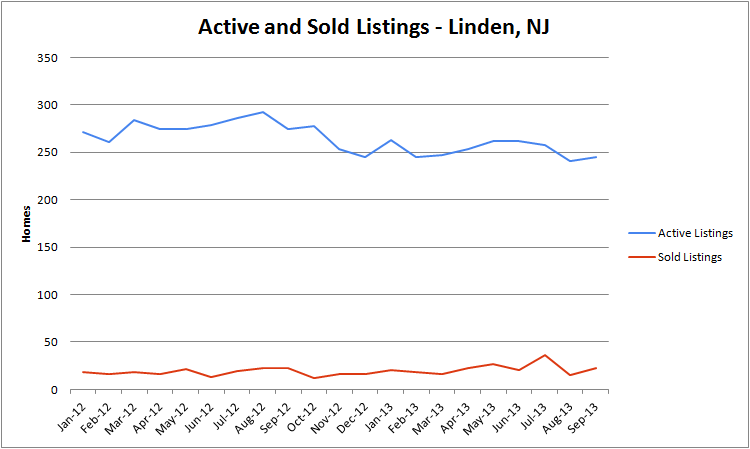 In Linden, the months inventory has been decreasing pretty steadily for the past 18 months.